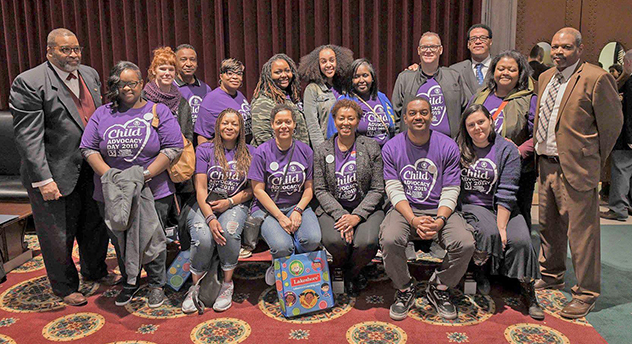 Parents as Teachers staff joined a community of parents, children, and professionals who value the health and well-being of every child and are dedicated to each child reaching their full potential with no barriers to their success at the Missouri State Capitol in Jefferson City, MO for the 37th Annual Child Advocacy Day on April 2, 2019. While there, Parents as Teachers staff and administrators met with representatives of the Missouri House to thank them for supporting an increase for Parents as Teachers in the state’s budget, and to seek their support for several key legislative priorities of the day. The ‘2019 Hot Topics’ included support for Nathan’s Law to ensure child safety in childcare centers, funding for a Quality Assurance Report of childcare centers, reestablishment of the Trauma-Informed Care Task Force, and increased access to health services in rural areas for children. Many state representatives greeted PAT staff and posed for pictures in the State Capitol. Below pictured far left is State Rep. Dr. Alan K. Green (D-Florissant). Far right is State Rep. Alan Jerome Gray (D-Blackjack); Back row third from right is State Rep. Chris Carter (D-St. Louis City). Staff also were introduced as guests of the Senate and met with many Senators before attending policy workshops. In all, more than 500 advocates from across the state rallied to protect and advocate for the most vulnerable population among us, our children.